Hello and welcome to this leading UK music site for children, teachers and parents. As well as new songs to sing (visit our songs page), you’ll find pages packed with musical instruments, information and fun things to do. Simon is one of the world’s leading mandolin virtuosos and composers for the instrument, as well as a fine fiddle player and guitarist. 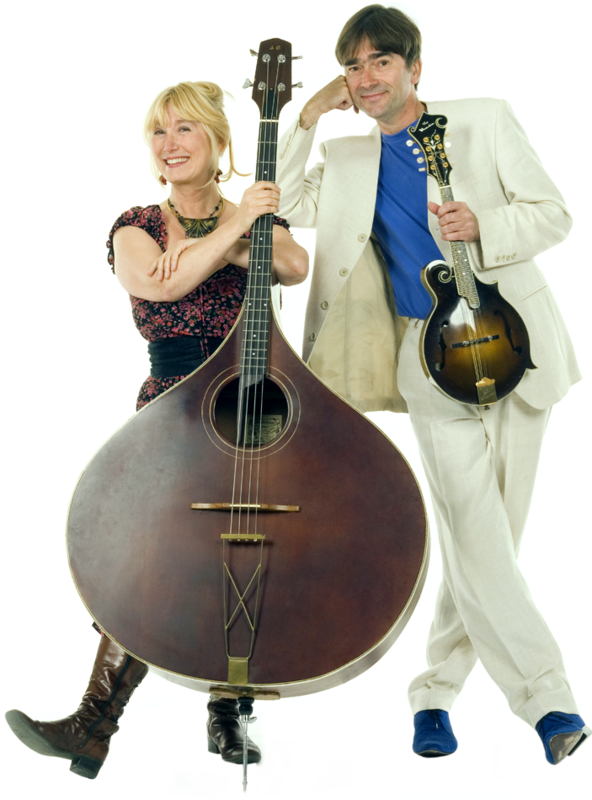 Hilary has ‘one of Britain’s finest voices’ (BBC Radio 4) as well as an unusual taste in bass instruments. See her amazing giant mandobass. As well as touring the world playing concerts and festivals they have over 20 years experience of visits to schools, performing to pupils of all ages. By train, tractor, bicycle or even hot-air balloon – the Musical Mystery Tour introduces you to a lively collection of characters and places. Discover snowmen and kings, parrots and flamingoes, sleepy sheep and weeping willows – and even a donkey who can’t-can’t do the can-can! 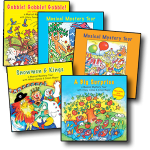 These delightful, witty songs are guaranteed to capture the imagination, and will be enjoyed by children of all ages – from 4 to 104! 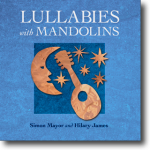 A bedtime collection of traditional songs and classical tunes, graced by Hilary’s sublime vocals and laced with Simon’s peerless mandolin playing. This is definitely one for the Mums and Dads too. 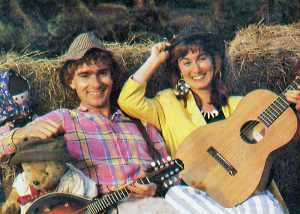 Simon and Hilary were the last guest presenters to appear on BBC’s Play School just a few months before the doors and windows on the Play School House were finally boarded up in 1988. The aniversary reunion was organised by Paul R Jackson, keeper of the Play School archives and supported by the Children’s Media Foundation. Read more and see the pictures. Hilary James’ article Make Time For Music (PDF file) offers some great ideas on how to give children the musical start they deserve. First published in Creative Steps magazine. Based on songs written by Hilary James & Simon Mayor. 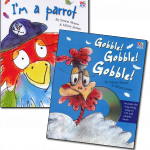 ‘I’m A Parrot’ and ‘Gobble! Gobble! 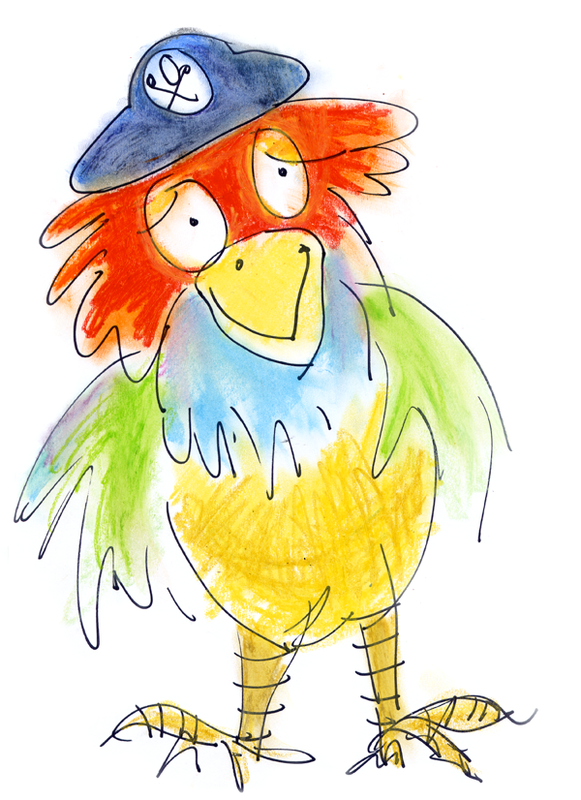 Gobble!’ are also illustrated by Hilary and contain music with ukulele chords and a singalong CD.